I am only doing bodywork for this car, but I had a couple of questions about mechanics. Simply because I am interested. The key does not turn in the ignition. the wheel is locked and i try to get it unlocked by turning it but it does not unlock. Any idea on why it could be locked? Maybe wrong key? Opinions: Should I paint regular black headlight surrounds and grill white, as they were (see pic) or keep them black? Sounds like she probably gave you the "doors and trunk" key. The key doesn't fit in anything... It must be something random. I will ask for a key or have a locksmith come make one. In case someone opens the thread but CBA to watch the video, the key turns in the cylinder but the car won't crank or shift into Park. Paint the headlight surrounds the original white, as the grille was from the factory as well. There were only about a thousand of these that sold; an unusual Volvo! Too bad it doesn't still have the original wheels. That would really take it back as a period piece. Last edited by benski; 07-28-2015 at 07:48 AM.. I might paint it.. I'm still debating. I have this perfect surrounds and grill.. I don't mind painting the grill but the chrome on the surrounds might be hard to get off and on without damaging.. Thanks for the update! Did you ever figure out what was going on with the key? I did not.. The key still turns without any noise from the fuel pump or engine.. I am guessing it has to do with some of the major damage done during the collision..
Update: Welding done, Rust resistant paint on, absorbers on, Main metal piece on and tray on as well as bumper. It's looking like a car again! Obviously I still have work to do on that hood. Or, even better, keep your eyes out for a California White flathood.. Thanks!!! Are you going to de-crunch and paint the driver's fender too? Yep going to figure out the hood tomorrow. The girl had a little bottle of OEM volvo touch up paint in the glove box, so I will maybe use that to touch up the fender. Last edited by Beforedenied; 08-07-2015 at 05:13 PM..
Last edited by Beforedenied; 08-07-2015 at 07:03 PM.. 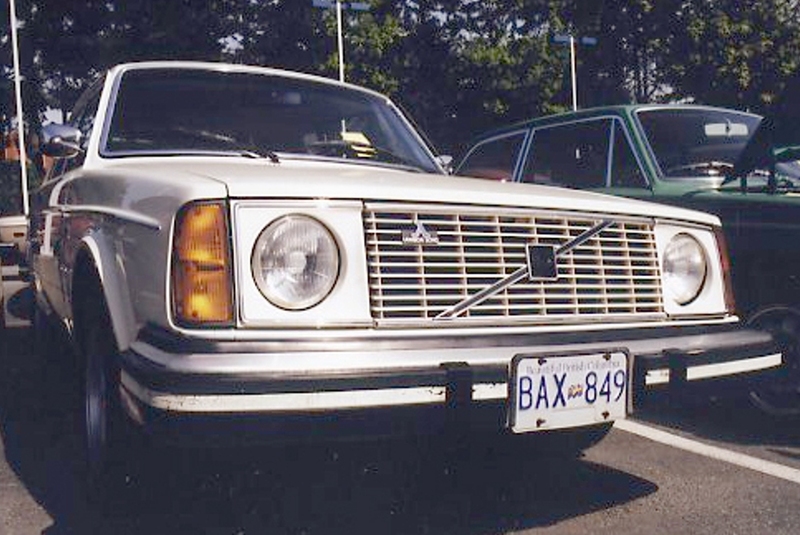 The headlight surrounds and grill were originally the same off white as the body. Looks like you are kind of doing this on the cheap though, so matching to body color probably isn't an option, especially now that you rattle canned them. Sounds like the neutral safety switch has popped out of it's place. You can remove the 2 screws on the shifter cover and lift it up to look pretty easily. Yeah I'm not getting paid enough to color match paint. I quoted them for that, and for hood repair and repaint and they said nah just do what you can. So I did what I could with a can. I think that they look fine this color. How sure are you they were the same off white? Have you ever seen one in real life? I've seen 3 or 4 in person. I still have a set of white headlight surrounds in my stash of parts also. I was surprised they are actually white plastic, not just painted. If it's not in park or neutral it won't start. If the safety switch is out of place, it won't know if you are in park or neutral. Judging by how the shifter won't go all the way forward, I'm guessing the pin is not in it's proper location.